Although pairs are known to exist in open star clusters, more often than not, none are usually listed. This mainly because all the cluster members are already gravitionally bound in the cluster system. It is also thought that many pairs form is clusters, but these are commonly only temporary binaries, which can be torn apart by the internal cluster’ dynamics. For NGC 4755 only four (4) pairs can be found in the Washington Double Star Catalogue (WDS), and these are B 805, JSP 561, JSP 563 and JSP 562 / HDS 1808. B 805 (12540-6020) is listed as 4.3 arcsec separation and position angle 265°, whose description appears as Star 3 in ‘Some Bright Individual Cluster Stars’ (See Page014.htm). However, no new measures have been obtained since W.H. van den Bos discovery 1927. Re-measuring the pair using the CDS ‘Aladin’ was impossible to do even with significant image manipulation. I originally suspected that star B805 C was the component which lies 15.1 arcsec along a similar PA of 274°, but this seems a little too large a displacement in the years that have passed since 1927. 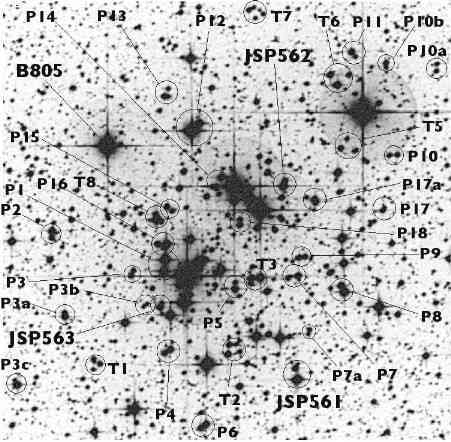 Examining the proper motion of the other bright Jewel Box stars finds no unusual motions either in velocity or direction. We can only conclude that unless the companion star B 805 C has significant motion in the opposing directing to the primary, this cannot be the star that van den Bos discovered. B 805 AB magnitudes are listed as 6.77V and 13.2v, with the primary being of spectral class B1/2b. It is nearly impossible for any amateur equipment to resolve mainly because of the significant difference in magnitude (Δm). I have never seen any visual reports regarding this pair. This would also apply to the outlying components as well. No component was seen in 20cm or 30cm. It is uncertain if any of these stars are physically attached from the lack of any real observed motion. Only the proper motions have been determined for the main star being -012 and +002 mas per year. I have also listed separately the two other wider and faint companions as ‘AC’ and ‘AD’. HDS 1808 (12536-6021) are the stars No.4 and No.8 that appears in the ‘Bar’. It is the Harvard Double Star (HDS) discovered from Cordoba, Argentina in 1892, whose separation was measured as 17.3 arcsec along the position angle of 43°. According to the latest measure in the WDSDec04, the position angle has remained as 43°, and whose movement in minor even when taking precession into account. Separation is 17.1 arcsec (2000), and it is perhaps decreasing, judging by the changed by -0.2 arcsec. The pair is easily and cleanly divided in 5cm — being the brightest of the recognised and unrecognised pairs in the Jewel Box Cluster. A spectral class of B3Ib: is given while the companion is tentatively given as B0. Needless to say both appear either white or bluish-white in the telescope. JSP 562 (12536-6021) is a faint pair of 10.9v and 11.0v magnitude whose separation in the WDSDec04 is given as 3.3 arcsec along PA 205° that was last made in 1965. From this, the pair may be decreasing both in separation and position angle. Megastar 4.0 and 5.0 place the position of the pair in the wrong place, being the star in the Figure below, immediately eastward of the pair P17. It is in fact 1′ west of the‘Bar’ or 36 arcsec NW of HDS 1808, and this position agrees with that given in the WDS04. Using ALADIN I measured the pair as 5.76 arcsec along PA 338°, suggesting significant change in the last forty years. As first I questioned if I had the correct star but no others match the brightness or placement. JSP 561 (12536-6025) this 9.9v and 10.9v magnitude pair lies about 2.8′SE (PA 224°) from Kappa Crucis itself. JSP 561 was discovered by M.K. Jessup in1929 who measured 2.1° with an easterly position angle of 93°, but unfortunately the latest version of the WDS04 still gives only this solitary 1929 position. I remeasured this using ALADIN 2.5v, finding a mean of 1.53 arcsec along PA 97.0° (n=5) On observation of the pair I found it could not be resolved cleanly in either 20cm or 30cm, and this closer measure may explain why. A future observation or two would be quite useful to confirm the pair is seemingly closing. Spectral class of the primary is B0. A third component, JSP 561 ‘C’, exists which lies 12.90 arcsec along PA 4.6° from the primary ‘A’. This 11.5v magnitude component star is visible in 15cm with care and clearly seen in 20cm. JSP 561 ‘C’ does not appear in the pages of the current WDS. JSP 563 (12539-6023) is the third recognised system and is one of the easiest of the pairs to resolve that lies some 41.0 arcsec SE (PA 134°) from the bright star Kappa Crucis. Discovered by Jessup in 1930, this 10.4v and 12.9v magnitude pair suggests it is rapidly widening — being 1.4 to 3.8 arcsec (1974) in just 44 years. This is also combined with moderate changes in reducing position angle by -10° (270° to 260°) (WDSDec04). Oddly the WDS gives the 1974 positions as 3.8 arcsec along PA 260° — which does not agree well with my ALADIN measures of 4.74 arcsec along PA 323.3°. Although the 4.7 arcsec is close to what would be expected for linear motion, the PA seems to have gained in the opposite direction. Figure 9. shows the positions of various doubles and triples that can possible be seen optically within the cluster. I have selected only those with the most interesting or obvious ones that are possibly visible in apertures anywhere between 10cm and 50cm. Eighteen pairs (P) and seven triples (T) are given in the 5′ area of NGC 4755. Most within the selection range between 11.0 and 16.5 magnitude. Most of the following wide pairs and triples have been measured using ALADIN v2.5. Although they may or may not be physically connected as pairs or doubles they are likely visible in amateur apertures above 20cm or so. Some may provide interesting challenges for larger apertures, even though I have not seen some of the fainter ones from my own lack of aperture. P15 16.51 255.2 AB 12.1 12.6 — JSP 561, 562, 563, HDS 1808 and B805. P4 — Both stars appear yellow. P9 — The secondary appear also as a double whose separation is 2.4⁑ along PA 316°. The companion is estimated at about 15th magnitude. P10c (Not plotted) — Another faint pair lies due south by 55 arcsec of 5.7 magnitude Star A / HIP 62894. P10c can be easily spotted a little south of half distance between T5 and P10, and on the Figure lies next to thetelescopic ‘spike’ from the bright Star A. I saw this pair as elongated in 20cm but did not inspect it in 30cm. The occultation bar certainly made the stars more pronounced and an deep-sky observer would be advised to do the same. T5 AC — This star was originally seen as elongated. With image manipulation using ALADIN v2.5 the separation of 3.49 arcsec and the PA 100.1 (n=4) was obtained. ‘T5A’ is only 41 arcsec NE (PA 39°) from 5.7 magnitude Star A / HIP 62894. To see the AC pair I used an occultation bar to remove the brightness of Star A in 20cm. I could see all three stars and just resolve T5AC in the 30cm. I’d also recommend viewing this, like T6a below, using as high as power as the seeing conditions allow. Definitely not for the faint hearted! T6 AC — This star was originally seen as elongated but is clearly double. With image manipulation the separation was obtained with ALADIN v2.5 as 2.83 arcsec and the PA 128.6 (n=3). I considered removing this pair as the A and B components are fairly wide, but this additional possible ‘new ’ pair I decided to add it. ‘T6A’ is placed only 47 arcsec (PA 146°) from 5.7 magnitude Star A / HIP 62894. To see the triple I used an occultation bar to remove the brightness of Star A in 20cm. I could clearly see all three stars but did not resolve T5CD in either 20cm or 30cm. T7 — This is actually a polygon of stars, only the main pair is likely visible. This is a good test for large to very large amateur apertures. ‘T7 E’ is certainly very challenging. In 20cm I could see only T7 AB, while 30cm revealed AB, AC and elongated AD.